Pristine Detailing are a vehicle valeting company based in Lingwood, Norwich offering a range of valeting packages starting at £55 to return your vehicle to its showroom shine, inside and out. We are fully mobile so we come to your home or business premises, saving you the hassle of going out. A vehicle valet is not just about giving your vehicle a wash and chamois down. Pristine Detailing start with a basic package that includes a full valet of the vehicle, interior and exterior cleaning, exterior trim detailing, floor mats and boot hoover and vents cleaned with a detailing brush. Pristine Detailing give your vehicle the complete clean and return it to showroom shine, every time. View our vehicle valet prices. We work on private vehicles and fleet vehicles and can arrange a contract cleaning service if required to ensure your vehicles are always looking in top condition. Contact us to arrange a vehicle valet. All vehicle valets are done using a 3 bucket method, one to wash, one to rinse the mitt in between to prevent dirt going back on to the vehicle and the last bucket is used for wheel arches and tyres. The vehicle bodywork is hand washed with plush microfiber wash mitt and gentle ph. balanced shampoo containing carnauba wax for a great clean. Every vehicle is dried off using plush non scratch microfiber towel and a replenishing drying wax before having the bodywork buffed for a great shine. The vehicle tyres are first cleaned to remove the dirt and then product is applied to black the tyre giving it that brand new look . Your vehicle isn't truly clean until all the dirt is gone. Cleaning the door shuts gets all the dirt out from inside the door frames and in the sills. You wouldn't see this from outside the vehicle but when the door is opened it has to match the rest of the bodywork. That's why we treat the door shuts in the same way we do the rest of the vehicle. The wheels and arches are first rinsed off and pre-treated with a non-caustic solution before we clean the wheel with a professional non scratch wheel brush. The wheel arches are then thoroughly cleaned and rinsed off. All glass is cleaned and polished inside and out. You will certainly be able to see clearly when we have finished with your windows and you will be able to perfectly see the amazing job we will do of your interior too. You might be surprised what's included in our entry level Detail. Using only the best products on the market today and safe techniques, using 3 buckets with grit guards with every wash and detailing tools, we will get your car looking as good as the day you purchased it. With a glossy shine and a clean fresh scented interior.Exterior is finished with a detail spray and buff for extra gloss and all exterior trim restored,all interior trim is cleaned and restored to new finish. Your convertable top will be brought back to as new condition removing the unsightly green and bird lime and other contaminates from your fabric and protected with a Nanolex Convertible Top Sealant to form a semi-permanent water and oil repellent barrier that lasts 12+ months,longer if kept under cover. It is a self-organising microfilm of nano-scale components that dries to form an invisible and fully breathable coating that chemically bonds to treated surfaces at the molecular level. Following application, rainfall simply beads up and rolls off of treated surfaces, taking surface contaminants with it. This is a full attention to detail of interior for vehicles that require a little more than a hoover and polish. All seats, carpets, boot and roof lining has a deep clean including all interior trim, removing stains and odours from the entire interior of vehicle. A full clean of all interior trim, finishing off by protecting your interior from future spillages that lays down an invisible and highly hydrophobic barrier that repels liquids and soiling. We will require your vehicle for the day. This is designed to protect the exterior of your vehicle from the harsh elements such as insect fluid, tree sap, bird lime, fallout, acid rain etc. Your vehicle is cleaned in the usual manner then goes through a process to remove all bonded contaminates from the exterior of your vehicle finishing off with a durable carnauba-based wax, for a concours winning shine, and 14+ months protection and sealed with a Hard Shell sealant to help preserve the wax applied. For more information on how our Diamondbrite treatment could benefit your car take a look at the Diamondbrite treatment page. If your paint is looking a little flat and the shine has gone this is a good option to have within a reasonable budget. 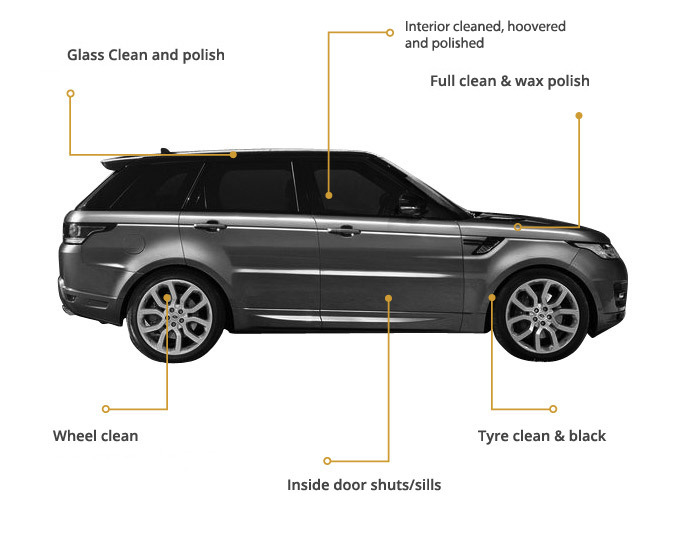 By having a single stage machine polish we aim to remove a good percentage of swirls, blemishes and maring to restoring depth of shine and clarity to your paintwork. 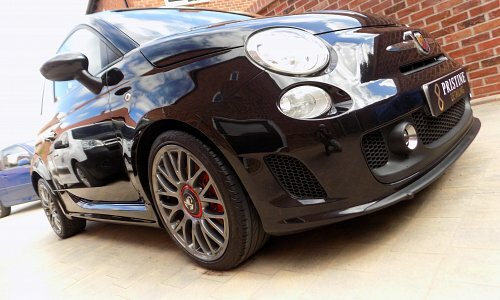 Wilma my fiat 500 had a mini valet today by Pristine Detailing and WOW! Very happy customer! She's sparkling!! 100% recommend!! Just had Dan @ Pristine Detailing clean my car. FANTASTIC job. He took time to leave my Range Rover looking beautiful!